(St. John’s, NL) The Dream Fund’s Decade at Sea Cruise Lottery (17-10278600LT) has been cancelled, effective immediately, and all Primary Ticket Holders will be refunded in full. Due to several major setbacks and an unexpectedly low demand for tickets, The Dream Fund is unable to continue the Decade at Sea Cruise Lottery at this time and meet the financial obligations of the Early Bird and Grand Prizes. While the public response to the Cruise Lottery was overwhelmingly positive, that response clearly did not translate into ticket sales, with sales much lower than targets. Service NL has advised The Dream Fund to refund all Primary Ticket Holders. All Primary Ticket Holders will be refunded in full. “Primary Ticket Holder” is defined as the person whose name appears on the Official Ticket. In the event that you ordered a ticket as a gift or for someone else and placed their name on the Official Ticket, the refund must be delivered to that person. All orders by Credit Card will be refunded directly to the credit card used. All orders by Cash will be refunded by cheque delivered via Canada Post. Primary Ticket Holders will have until January 8, 2018 to cash their refund cheque. The Dream Fund cannot guarantee refunds past that date. Any tickets won through online promotions or OZFM will be refunded at the face-value of the ticket. Please allow some time for refunds to be delivered. The holiday season may cause some delays in this process. Any concerns or displeasure with this decision will be forwarded to Service NL. All ticket numbers have been voided and no prize draws related to the Decade at Sea Cruise Lottery will occur. If you would like to return your refund as a charitable donation to The Dream Fund, please visit www.thedreamfund.ca to donate online, or mail a cheque to “The Dream Fund” using the address above. The Dream Fund would like to thank their presenting sponsors NTV, OZFM, The Newfoundland Herald, and The Telegram, as well as their marketing team at JAC, volunteers and everyone who ordered a ticket or even shared a Facebook post for their support in this project. The Dream Fund is a registered Canadian charity that makes dreams come true for critically ill children across Newfoundland & Labrador. Founded by William Short at the age of 14 with a goal of giving sick children something to make their everyday life better, we have made the dreams of more than 30 children come true. Announcing the Decade at Sea Cruise Lottery! We’re celebrating our 10th Anniversary in a big way this year! Join us and help make dreams come true. The Dream Fund is a registered Canadian charity that makes dreams come true for sick children across Newfoundland & Labrador. Since 2007 we’ve put smiles on the faces of more than 30 children and families, and we don’t plan on stopping any time soon. Our goal is to give a sick child something from their dreams that will keep them occupied, take their mind off painful treatments, and make their everyday just a little better. We do this by #LiftingHearts, one dream at a time. Through the Decade at Sea Cruise Lottery, our goal is to raise enough funds to further enhance our program, making an even bigger difference in the lives of sick children across the province. Come celebrate with us at The Dream Fund’s 10th Annual Christmas Concert! We have another great show for you this year. Doors open at 6:30 PM, show starts at 7:30 PM. Available at the Marystown Hotel Front Desk or Online! A limited number of tickets will be available. Check out our Facebook Event for updates! About The Dream Fund: The Dream Fund is a registered Canadian charity that makes dreams come true for sick children in Newfoundland & Labrador. Founded in 2007 by William Short at the age of 14, we’ve been working hard to make a difference. To date we have made dreams come true for 31 children, delivering everything from iPads and digital camera to home theatres and complete bedroom makeovers. About You: You’re creative, organized and outgoing, comfortable on the phone, and willing to talk to potential customers. You’re able to work independently and in a team, taking direction and taking the lead. You’re good with numbers and technology. You enjoy the thought of working with a children’s charity to help better the lives of sick children, and you can represent the organization well. The ideal candidate will have some experience within volunteer organizations, retail sales, and scheduling. The successful candidate must be capable of using technology, specifically iPad, Microsoft Excel, and Instagram. About the Position: The Sales Coordinator will be responsible for selling tickets from our Avalon Mall kiosk at prime hours during the week and completing the required data entry. They will also coordinate with volunteers to create a schedule, ensuring coverage of the kiosk during most Mall Hours. The successful candidate may also be required to perform necessary administrative or other duties for The Dream Fund. How to Apply: Apply by email at apply@thedreamfund.ca using the subject “Sales Coordinator”. Please attach your résumé and cover letter in PDF format. 10 years ago today, a dream came true. On June 21, 2007, The Dream Fund was launched at Pearce Junior High School in Burin, NL. A lot can happen in 10 years and we’re proud to say that we’ve put smiles on the faces of 30 sick children across our province. Come celebrate with us this year! Our 10th Anniversary crest was designed to incorporate many elements. The colours come directly from The Dream Fund’s current logo, keeping the same colour scheme since we launched as the Short Circuit Dream Fund in 2007. The yellow circle represents the sun from our original SCDF logo, rising above the horizon. The boy with balloons comes directly from our current logo. Here, he is sailing through the sky, silhouetted by the sun, as he explores his dreams. The dark green line represents the horizon above which the sun is rising. It can also represent the rolling, grassy fields of our own dreams. The dark green line cuts through the bottom of the 10 to show that we aren’t finished yet. So long as there are sick children, we’ll be there to put a smile on their face. It is with a heavy heart that I announce I am stepping down from my active duties as the Chief Executive Officer for The Dream Fund, effective immediately. When I launched The Dream Fund at my junior high school in 2007, I never could have dreamed we’d be where we are today. In the last 9 years we have raised upwards of $150,000, hosted countless successful fundraisers and events, and most importantly we’ve made dreams come true for 30 sick children and their families. It has been an absolute pleasure to be at the forefront of these accomplishments—working with, meeting, and affecting the lives of so many people. Having completed my Bachelor of Business Administration about two years ago I have been working hard to develop my personal career. While my role within The Dream Fund has always been voluntary I have held enormous responsibility over the years, taking up much of my free time outside of school and work. As I work to build a successful career, as well as other aspects of my personal life, it has become evident that I need to step away and reduce my responsibilities with The Dream Fund. Don’t worry, I’m not disappearing completely, I’ll still be performing some administrative duties and volunteering wherever possible. Knowing that eventually I may have to step away or decrease my responsibilities I have worked with our Board of Directors to make necessary changes to The Dream Fund, and I have personally put a lot of time and energy into ensuring we had the best board members to actively take a lead in the organization’s future. I am confident that The Dream Fund’s Board of Directors, in coordination with a dedicated group of volunteers across the province, is prepared to take the reigns. I encourage everyone to continue supporting The Dream Fund as we continue making dreams come true for sick children across Newfoundland & Labrador. Donate, volunteer, attend an event, or plan your own fundraisers—there are so many ways to show your support for this incredible local charity. If you have any questions please feel free to contact me at william@thedreamfund.ca or 709-277-5177. And now for the moment you’ve all been waiting for………..
You can click here to view the list of dedications from our 2014 Wings for an Angel Butterfly Release. Names were added as best interpreted from written order forms, so please do not hold any mistakes against us. If you do notice an error and would like it corrected, do not hesitate to contact dream@thedreamfund.ca and we’ll fix it as quickly as possible. Note that the 2015 release is in the works and is scheduled for July 18, 2015. Many regions do not yet have a planning committee in place and we cannot support a release without a committee. If you’d like to ensure a release in your area, please get in touch with us. The Dream Fund and 740 CHCM are pleased to announce that the 7th Annual Christmas Concert featuring Shanneyganock, The Coastals, and The Likes of Jeff Pittman has sold out! The event is scheduled for November 22, 2014 at St. Gabriel’s Hall, Marystown. Doors will open at 7:00pm so concert-goers can enjoy some refreshments at the bar before the music begins at 8:00pm. If you’ve got your ticket, you’re in for a fun-filled evening hosted by none other than Jeff Pittman himself. A huge thank you to St. Gabriel’s Hall, Nora Gaulton and the great crowd at Fewer’s Unisex, and all of you who were able to purchase tickets to the show. In collaboration with Connected to Newfoundland – Andrea Edwards Photography, we’re excited to announce a contest! 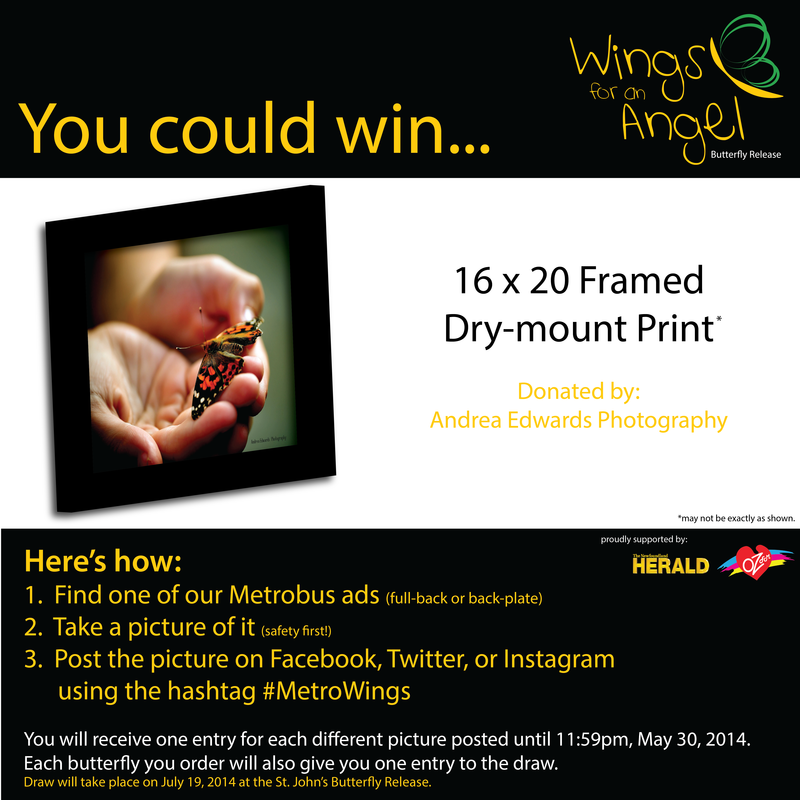 Post a picture of one of our Metrobus ads on Facebook, Twitter, or Instagram using the hashtag ‪#‎MetroWings‬ and be entered to win a 16×20 Framed Dry-mount Print of our promotional picture! Each butterfly you order will give you an additional entry into the contest. Sharing or retweeting our contest posts on Facebook or Twitter will also give you an additional entry.